Asymmetrical Drape Top with a Scooped Back – Everything Your Mama Made & More! I was flipping through my patterns to see what I had with an open-ish back and thinking about how much I love the Asymmetrical Drape Top, when inspiration hit. 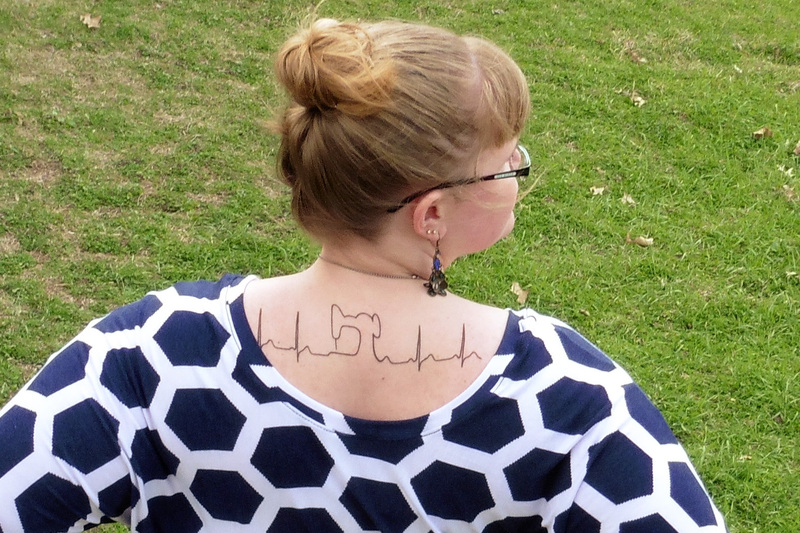 I decided to try using the scooped neckline meant for the front on the back, too! Turns out, it’s perfect for my new tattoo! To re-create this scooped back hack, you first need to cut two bodices with the “front” neckline instead of one “front” and one “back” neckline. You’ll also need a longer neckband than the listed measurement. To figure the length needed, measure the scoop neckline for your size and take it times 2 (for front and back total). Then take that total times .85 (to find 85% of the length) to figure how long your neckband needs to be. If your fabric is very stretchy like mine, you can even go as small as 75-80% of the neckline measurement. Having the band smaller than the actual neckline helps it lay flat in the finished garment. 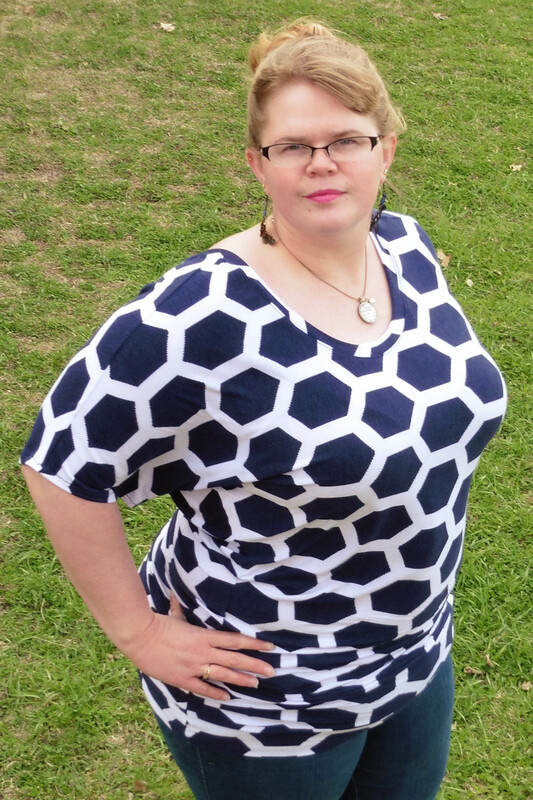 I just received this rayon spandex blend jersey in the mail this past week. I bought it from a member of the KnitFix Facebook group who decided it wasn’t her style (or maybe she was just raising funds for this month’s fix ;-)). 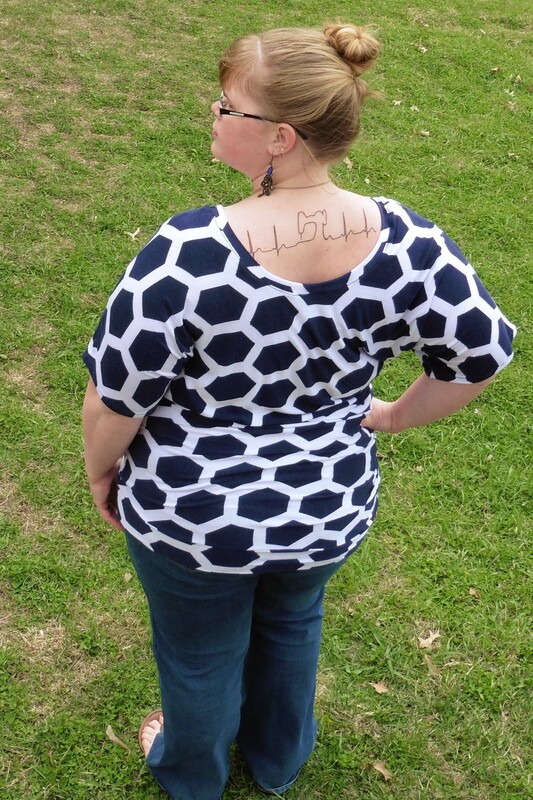 The white honeycomb on blue jersey was part of Girl Charlee‘s February KnitFix and I’m glad she didn’t use it because I love the scale of the print! I thought this was the perfect week to hack the Asymmetrical Drape Top since it was marked down earlier this week for the Manic Monday Flash Sale. Were you one of the many who scooped it up on sale? If you missed out, you’ll have to check back for next month’s Manic Monday! Keep and eye on the EYMM Facebook page or join the EYMM Facebook group to see when the next sale will happen and to show off your EYMM creations!